On the outskirts of the city is Pere LaChaise cemetery. It’s an enormous graveyard and is full of generation of families and famous ex-pats. There are several notables buried here, including Edith Piaf, Jane Avril, Stephan Grappelli, and Seurat, to name a few. It would be impossible to find all of these graves, but we managed to find a couple people you might recognize. Menilmontant is a wonderful silent film. We stopped by to pay our respects to Oscar Wilde. I was absolutely infuriated by the state of the head stone. It was (at one time) a lovely deco-style sculpture but it had been destroyed by graffiti. It was covered in notes in pink and red marker and black sharpie. It was maddening. I refuse to post a picture of it. Then it was back on the Metro to Montmartre and Sacre Coeur. I was hoping for the neighborhood, artist’s colony feel but unfortunately it was simply overrun by tourists and more guys selling awful trinkets. 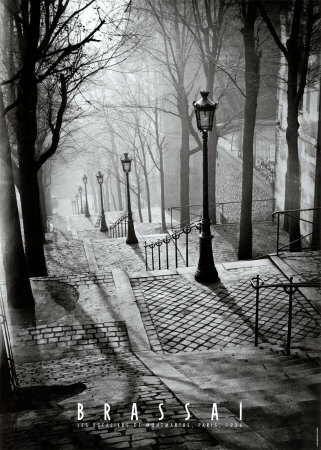 The famous steps of Montmartre. Of course, Brassai’s is better than mine. We stopped at a grocery store to get some slightly more affordable food to eat for dinner, then crashed at the hotel. By this point, I couldn’t wait to get on a plane and away from France. And I hate flying. The next morning, we rode the Metro to Gare du Nord, then caught another train to Charles deGaulle airport. On that train, we suffered at the hands of incredibly awful, rude people who shoved our luggage into other riders. Then, at CDG, we stood in a line that was over an hour long because the United/Continental desk was so unorganized. Security was nonsensical, and trying to get a croissant at the Starbucks was inane because people didn’t line up. Just rushed the counter. Luckily, both plane rides were uneventful (although the transfer at Dulles was also ridiculous). Keep watching this blog for more stories. I’ll be revisiting the Edinburgh photos soon since I didn’t have much time to post about it earlier.